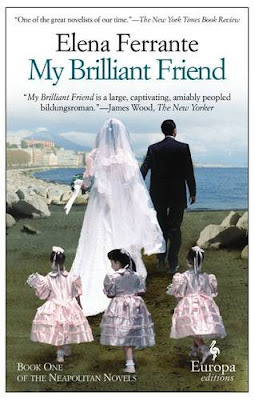 Originally published in Italian, My Brilliant Friend is a coming-of-age novel about two young women growing up in Naples during the 1950's. Lila is smart, confident, manipulative, and fearless. Lenù (the one telling the story) is also smart but a little more timid and unsure of herself. She seems to rely a great deal on Lila for her self-esteem. But therein lies the intrigue of the whole story for me. Their friendship is extremely complicated, and I spent the whole book wondering, Who is really the dependent one here? Or are they both dependent on each other but since we're getting it from Lenù's perspective, we don't realize how much Lila is really dependent on her? I was reminded of one of my best friends who I roomed with during my freshman year of college. That first semester, I was extremely homesick--like, losing weight, begging my parents to let me come home, failing my classes kind of homesick. Beth was one of the reasons why I actually survived that semester and, by extension, college. She was really the only one who knew I was having such a hard time, and I was so grateful for her. The next semester, my homesickness was completely gone, and I was thriving when all of a sudden, the same kind of homesickness hit Beth like a wave. Then it was my turn to be the shoulder and support until she made it through. I've always thought it was so ironic that we didn't both get homesick at the same time but rather took turns so we could help each other. Although my experience is on a smaller, far less complicated, scale, that's kind of what Lila and Lenù's friendship is like. Lenù herself senses this give and take and says: "In that period it became a daily exercise: the better off I had been in Ischia, the worse off Lila had been in the desolation of the neighborhood; the more I had suffered upon leaving the island, the happier she had become. It was as if, because of an evil spell, the joy or sorrow of one required the sorrow or joy of the other." However, in spite of their close connection, there's also this deep-seated animosity (or, perhaps that's too strong a word--jealousy, competitiveness?) that underlies it all. One moment they're helping each other, even to the point of making great personal sacrifices, and the next, they're silent and resentful and avoid each other. There's one scene that still baffles me but that I feel holds some sort of clue to understanding their friendship. It happens early in the story, when they're both still fairly young. Lila suggests that they skip school so that they can walk to the ocean and see it for the first time. Lila is usually the one to come up with fantastic, dangerous plans, but Lenù agrees. They make the necessary plans to deceive their parents so that they can be gone the whole day without anyone noticing, and they set off. It's a long, hot walk, and after they've been going for several hours, they notice a storm on the horizon. Even though they're close to their destination, Lila, usually the fearless one, insists that they turn back while Lenù wants to keep going. Lenù says, "A mysterious inversion of attitudes had occurred: I, despite the rain, would have continued on the road, I felt far from everything and everyone, and distance--I discovered for the first time--extinguished in me every tie and every worry; Lila had abruptly repented of her own plan, she had given up the sea, she had wanted to return to the confines of the neighborhood. I couldn't figure it out." I couldn't figure it out either. Was Lila really, inexplicably, afraid? Or was she trying to get Lenù into trouble (remember, I told you their relationship was complicated)? Or was it actually a foreshadowing of things to come: Lila was more comfortable at home where things were far from perfect but at least she knew how to deal with them while Lenù was more content with the new and unknown (but didn't really realize it yet). The story reminded me a lot of Betty Smith's, A Tree Grows in Brooklyn. Maybe not so much in terms of the plot (I don't remember Francie being in the middle of a volatile friendship), but more in the tone and setting. The slums of Brooklyn and the slums of Naples seem to have a lot in common. They're dangerous and dirty and just so, so violent. People are murdered by their neighbors, weapons and threats are flashed about, and fights erupt at the least provocation. Abuse is rampant. Lenù describes it this way: "Life was like that, that's all, we grew up with the duty to make it difficult for others before they made it difficult for us." And of course, there are some rather frightening characters behind all that violence. But the thing I couldn't stop thinking about was this cycle that seems miserably common in poverty-stricken cities: the sins of the fathers become the sins of the children. Occasionally, the cycle hits a bump, as when a child tries to leave those things behind or when, alternatively, the child actually sinks lower than the parents, but generally the cycle just spins over and over, a seamless circle from one generation to the next. The book "ends" without really ending at all, and now I don't know what to do. You know I'm not usually a binge reader, but especially not when I'm trying to finish all my reading goals by the end of the year. However, I want to know what's going to happen, and I know that if I wait too long, I'm going to forget who everyone is (there are a lot of characters, and even though they're all very well-developed, they have similar enough sounding names that I'll never be able to remember who's who). Most of the other women in my book club had already put in their requests at the library for the second book, but I think I'm going to have to hold out until at least the first of the year. That, or I might have a mental breakdown. Over books. How pathetic. Content note: the aforementioned violence and abuse as well as some foul language (including the f-word) and a few brief sexual scenes. I didn't say the subject matter was easy. Okay, I've read such mixed reviews of this book (some love, some hate, some meh) that I decided it probably wasn't worth my time. But I completely trust your taste, so now it's definitely back on the to-read list. Thanks! I actually think you'll like it, and of course, I'll be interested to hear your thoughts when you're done! I will definitely take you up on your offer at the beginning of the year...provided you think it's worth reading, of course.